Forensic investigation also can require quick and accurate object measuring. 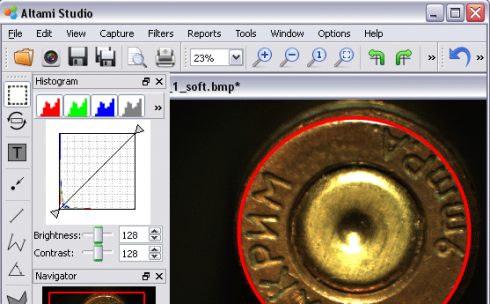 Altami Studio image analysis application possesses well-developed and easy-to-use tools which can be used in live mode and which provide important aid to a forensic expert. Image processing and analysis can be applied in the sphere of forensics in various ways, but we shall now concentrate on shell measuring. Altami Studio software provides various raster operations, among them вЂ” horizontal and vertical flips which reflect the image in a mirror-like way. This is especially useful for text recognition when the image is received in a distorted (mirror-like) way. Let us apply another filter – histogram adjustment, so that it would be convenient for the operator to work with the shell image. With Altami Studio software you can adjust brightness and contrast the way you would like to do it. Please find the result of your work expressed as a report in pdf format. Note that all described actions can be applied to live stream. You can learn more on this possibility at the features page. You can download Altami Studio software at the download page. You can buy Altami Studio software following the instructions at the purchase page.